7 Cat Favorites All in One Dish! This one-of-a-kind meal features the flavors of chicken, beef, turkey, salmon, tuna, shrimp and cheese. A combination so delish, it’ll bowl your cat over. 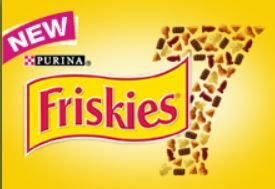 Sign up here to receive a FREE SAMPLE of new Friskies® 7!